Artem Dzyuba is a footballer who for much of his career divided opinion and often found himself stuck in controversy. After struggling for a long time to prove himself, he heroically rose to the task on the world’s biggest stage. In a fantastical turnaround he is now the nation’s sweetheart and Russia’s captain. Dzyuba Dictionary: Sectarians – Dzyuba has on numerous occasions alleged to the presence of subdivisions (sects) within Spartak Moscow. Artem Dzyuba grew up in Moscow, he came from an ordinary family and lived in communal housing until he was ten. He’s joked that everyone was friendly back then, even the cockroaches. As Dzyuba would probably tell you, the sociable insects were to be replaced by less amicable characters at Spartak Moscow. It is there where our hero started on his journey and actually first came to be painted as something of a villain. At eight years old, the tall youth named Dzyuba joined the Spartak Moscow academy. At seventeen he began to train with their reserves, and a year later he made his senior debut in the Russian Cup. In the following season he played regularly under Vladimir Fedotov. Fedotov put the first slight blemish on Dzyuba’s career. He’d caught Dzyuba reading a newspaper prior to receiving his tactical instructions and put him in the reserves. Although there are reports that he was singled out unfairly for this punishment, Dzyuba (who still loves to read, and sometimes quotes Harry Potter ) retains no ill-will against the late Fedotov. Stanislav Cherchesov (earlier sporting director with Fedotov) didn’t seem as keen on Dzyuba when he took over as manager. Playing for Cherchesov, Dzyuba spent most of his time on the bench and never played a full game. The famously disciplined and pragmatic Cherchesov probably felt Dzyuba could still work on his character and footballing qualities – after all, Dzyuba was only young and Spartak had plenty of other attacking options. This matches Cherchesov’s current approach to youngsters in the Sbornaya. In this way Dzyuba’s early start to life at Spartak was mundane, any set-backs were minor and not maliciously personal or controversial. It was once Cherchesov and Fedotov had left, that Dzyuba’s career started to veer away from a normal course. Not because Michael Laudrup briefly became manager, but because it marked the start of Valery Karpin’s stay within the management structure of Spartak. From 2009-2014, Valery Karpin would alternate between being sporting director and manager of Spartak. As sporting director he also chose the managers he worked with, beginning with Laudrup. Karpin took over from Laudrup as Spartak’s manager after just seven months. According to Dzyuba: Karpin disliked him from the off, and Dzyuba suggests that Karpin’s presence created division within Spartak. But that is only Dzyuba’s side of the story which came out when Karpin left much later. During Karpin’s time at Spartak, Dzyuba denied any conflict. Historically at Spartak what happens off the pitch is often as interesting at what happens on it, and for Dzyuba this would be no different. Long before Dzyuba stole anyone’s heart at the World Cup – he was labelled a real thief: accused of stealing 23,000 Roubles (at the time equivalent to around 400 Pounds or 500 Euros) from Vladimir Bystrov. When that money was found among Dzyuba’s personal belongings he was shipped off for a loan to Tom Tomsk. Karpin states that the incident was judged by the team, not by himself, or the club. Dzyuba insisted on his innocence, saying that he was set up, but he has never elaborated on what he calls the “dark truth”. His standing at Spartak was fairly low, no matter how you look at it – he was starting from the bottom. At Tom Tomsk, Dzyuba spent two seasons. 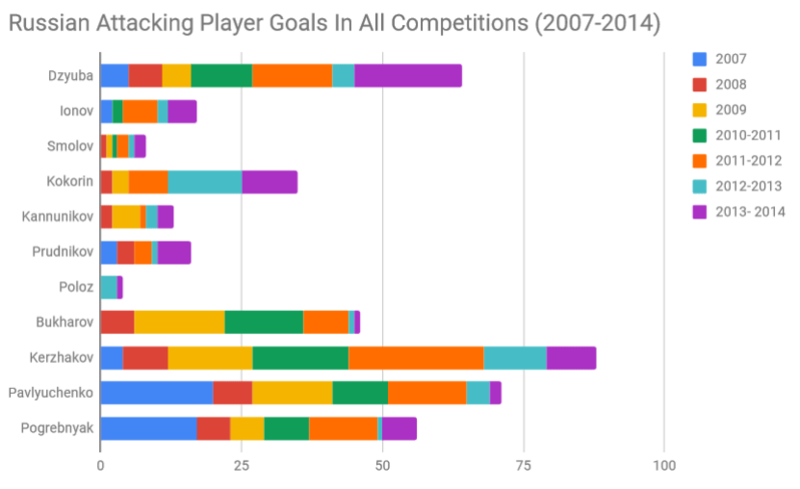 He gave a good showing to become the league’s fifth best goal-scorer in his second season. During the loan, Bystrov moved to Zenit St Petersburg, and so Dzyuba was able to later return to Spartak without as much awkwardness. If it had been anyone’s evil plan to freeze Dzyuba’s ambition in Siberia, it didn’t work out. It’s well-established now that Dzyuba and Karpin don’t get along on a personal level. Karpin did however use Dzyuba frequently after his return from Tomsk. Considering just how frequently Dzyuba played during the 2011/2012 season: he didn’t score a brilliant amount of goals (14 goals in 52 appearances). But impressively Dzyuba chipped in with 13 assists and occasionally wore the captains armband. On balance it was a highly successful season, by far his best at Spartak, and under Karpin no less. Ironically Karpin was actually going to resign during the start of that season over poor early results, and it was the players who’d convinced the board to let him stay on until the end of the season. Fans too would show their support for Karpin. So far from everyone disliked him the way Dzyuba suggests he himself did. On the other hand you could argue as Dzyuba later hinted at, that this support was based on outdated ideology and internal politics more so than footballing merit. A recent example for the presence of sectarianism could be the ludicrously popular argument attributing Massimo Carerra’s title win to Dmitri Alenichev (like Karpin, a Spartak veteran who honours the “Spartak Way”) , or even Carrera’s later dismissal amidst the current troubles at Spartak. Dzyuba Dictionary: Trenerishka/Trainerishka (little coach) – Dzyuba’s infamous diminutive nickname for Unai Emery. Following this, Dzyuba would also sometimes be called “igrochishka” (little player) as both an insult and an affectionate nickname. Dzyuba’s briefly promising return ended when Unai Emery became manager in the 2012/2013 season with Karpin back as sporting director. Dzyuba played much less and far worse – losing out to the likes of Emmauel Emenike and Yura Movsisyan. Midway through that season after a 1-5 loss to Dynamo Moscow, Dzyuba called Emery a “Trainerishka”, Emery got sacked, and Karpin got reinstated as manager. Dzyuba then started playing more but his goal-scoring didn’t improve. He also got into a conflict with the fans after he swore at one of them for criticising his performances. Dzyuba went out again reluctantly on loan but still denied at this stage that he had any conflict with Karpin. This time he went to FC Rostov, where he enjoyed probably his most impressive single season to date. With two years remaining on his contract, Karpin had wanted Dzyuba to renew for the duration of the loan (as was common practice) but Dzyuba was evidently already a bit upset at Spartak and refused. In the 2013/2014 season, Dzyuba scored 17 goals in 28 league appearances for Rostov and finished with only one goal shy of being the league’s top goal-scorer. More than anything Dzyuba appeared motivated by a sense of perceived injustice against him. But it remains uncertain that it wasn’t just a clash of stubborn (similar) personalities and emotional reactions. Despite in that season becoming Russia’s top goal-scorer by some margin – Dzyuba struggled to make it into the Sbornaya. Fabio Capello refused to bow down to popular outcry, saying that while Dzyuba was a good player, he was not a star and that Dzyuba was not quick enough for an international level. Dzyuba played only 107 minutes for Capello’s Russia and didn’t make it to the World Cup in Brazil. Dzyuba had outlasted Karpin, who lost his job during Dzyuba’s loan spell at Rostov. After proving his 23,000 roubles worth and adding back some interest, the tables were turning, but perhaps not quite enough for either side’s liking. Dzyuba’s contract was set to run out and the interest in Dzyuba from other Russian clubs was very high. Various deals were offered by Spartak, yet Dzyuba wasn’t satisfied with the terms. He insisted on a 5 year contract and a wage of over €3 million/year. The question was whether Spartak had been convinced enough to make a long-term investment in Dzyuba. Undoubtedly for Dzyuba it wasn’t merely a test of Spartak’s financial commitment but also their affection towards him. On his return Dzyuba had actually scored more goals on loan than he had done for Spartak, and in far fewer appearances. His rate of return on loan had been around a goal every two games. For Spartak, Dzyuba had scored around a goal every four or so games, but the trend there was undeniably upwards too. Whether or not Dzyuba was as gifted technically as some of his counterparts is questionable, but Dzyuba was good at scoring goals. Particularly when viewed as a young Russian player and a youth academy graduate, he had the right to feel he’d been a bit underappreciated in the past. Spartak’s owner Leonid Fedun, said that he was prepared to give Dzyuba the highest wage at Spartak (which at the time was around €2,7 million ) but could not match his demands. He also said that Dzyuba had wanted around €3 million, which he adds was a wage akin to that of Hulk at Zenit – and that Dzyuba wasn’t playing like Hulk, to justify that amount. Dzyuba would later claim that he had been put under immense pressure, as Spartak had tried to “provoke” him into signing on their terms. Spartak officially decided not to renew Dzyuba’s contract after three failed rounds of negotiations and this was when Zenit made their move, offering him a 5 year contract on € 3.3 million/year. He accepted Zenit’s offer and was set to join them once his contract ran out. Dzyuba’s wage at Zenit made him Zenit’s highest paid Russian but only sixth at Zenit overall, and with about half the true wage of Hulk. With five months to spare before his move, Dzyuba left Spartak for an inconsequential loan with Rostov. Then later Dzyuba got involved in a legal dispute with Spartak over his conduct while still on contract – a messy estrangement. With many great expectations for himself, the jury was out on whether Dzyuba could fulfill them. It had often been only his word against others’ and for the most part he had showed himself capable on loan. His goal-scoring record while on loan and self-belief were factors in his favour. On the other hand you could say that he was yet to prove himself at a big club like Spartak, and that his various scandalous intrigues weren’t endearing. Dzyuba had a difficult personality and even as a footballer wasn’t to everyone’s liking. How you score the goals sometimes matters, particularly at Spartak. At Spartak, style is sacred and arguably even more important than substance. It’s no surprise that Dzyuba’s lack of pace was often criticised, while Spartak bought lightning-quick foreign strikers and experimented with playing Dzyuba, their 6ft5 academy product, as a number ten. Spartak would have had to have changed more than just their manager to appease Dzyuba, and vice versa. Dzyuba had shown that he was capable of great feats when motivated, but would he have remained motivated at Spartak if the circumstances for that motivation were absent or even slightly off? Could he bank on stability given his prior experience with Spartak? Despite how it looked to fans, it’s doubtful that Dzyuba was foremost motivated by money. Most of all Dzyuba probably really wanted affection and status within the squad, things clearly not always forthcoming or realistic. As history shows – when this was absent Dzyuba became loud, problematic, and engulfed by negative emotions. 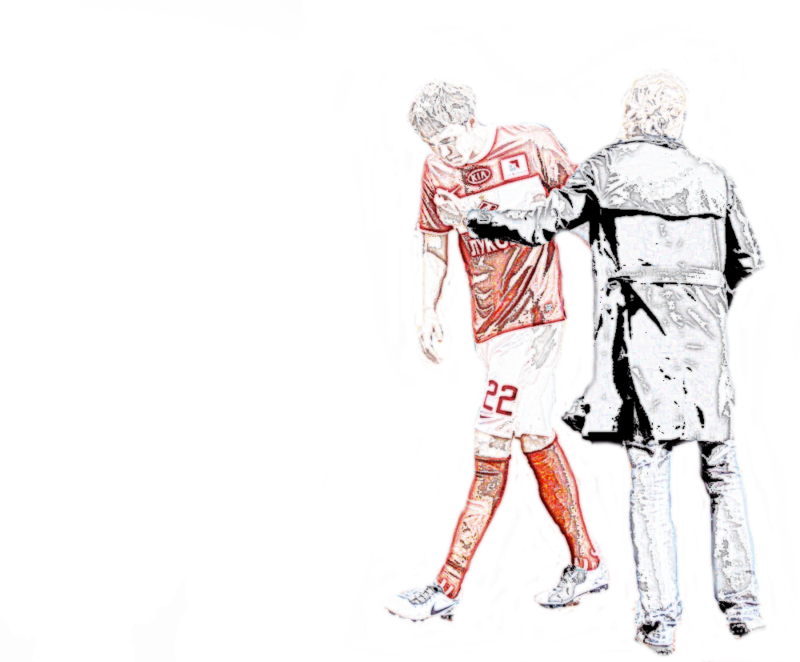 For Spartak, Dzyuba was detatched from their ideal – he had their DNA, but Spartak saw imperfections in him. In Zenit’s situation signing Dzyuba was more of a no-brainer – there was no familial strife. Adoption By Zenit: Turning The Tide? Dzyuba Dictionary: Dzyubinho – The most common and affectionate nickname for Dzyuba given to him by fans and team-mates. Made popular during Dzyuba’s time at Rostov. An ironic nod to his “Ronaldinho-like-skill” despite his size, rather than the literal translation: “Little Dzyuba”. Regardless of what Dzyuba may or may not have suffered in Moscow: it is either very brave or very foolish to come to Zenit from Spartak. Dzyuba followed in the footsteps of his former-rival Bystrov and was treated to the same indiscriminate hatred from both sets of supporters. This was aggravated by the manner in which he’d left Spartak with multiple legal disputes, as well as various incidents and quotes that followed in due course. Dzyuba risked being forever branded as a mercenary if he couldn’t pull off something special in St. Petersburg. However once again he had something to prove and his football had to do the talking – perfect. Dzyuba huffed and puffed to convince the Zenit fans of his worth. He gave a strong debut season for Zenit with an impressive 23 goals in all competitions – actually even surpassing Hulk. Though resentment from parts of the Zenit support persisted, others took well to their new signing – DZYUBINHO! Dzyuba had been signed as a ready-made replacement for Salomón Rondón, the Venezuelan who was preparing to become the sacrifice for a tighter limit on foreigners and Zenit’s new Financial Fair Play obligations. It is shamefully easy to forget Rondón from that era when Zenit was still a high-quality European side full of leaders and strong personalities. Aleksandr Kerzhakov’s exploits were also fresh in the mind of the fans and would take some replacing. But it was with a substantial contribution from the humble Rondón that Zenit had won the league title in the previous season. It’s worth remarking that in a footballing sense Dzyuba was quite similar to Rondón. Like Rondón, Dzyuba had more pace and skill than average strikers his size but couldn’t rely on either too often. Similarly his strength and finishing inside the box were probably his best assets, and very rarely would he take shots from outside the penalty area. Dzyuba was a bit more straightforward in his finishing but he liked to get involved more in the build-up play and make key passes – perhaps due to the influence of Spartak. At Spartak he had sometimes been made to drop excessively deep where he was less effective, but for Villas Boas – Dzyuba would mostly stick to a primary duty of finishing attacks. It’s not surprising then that given these broad similarities and his appropriate use – Dzyuba’s first season at Zenit was very close to that prior season of Rondón’s. Incredibly they both had 28 goals for Zenit after their first 58 games (Rondón made 58 appearances in total for Zenit). Dzyuba was certainly the more volatile personality and perhaps not the better footballer, but there was a new reality approaching Zenit, and top Russian players were becoming increasingly valuable assets. In this sense Spartak may have missed a trick. If Dzyuba had gone to Zenit after factoring in his ability to fill Rondón’s shoes, it was a very clever move – otherwise it was just a great piece of business by Zenit. You could effectively say that once Zenit sold Rondón and signed Dzyuba on the same contract – they’d paid themselves €17 million to sign him. Dzyuba and Zenit each had up to €17 million worth of breathing space – so to reiterate, it was objectively a much easier decision for Zenit. With the new age of the limit and Financial Fair Play, as well as slightly more flexible club politics – Dzyuba’s challenge at Zenit was far more likely to now come from other top Russian players and his own mental state. Dzyuba Dictionary: Dzyubinator/Dzyubaminator – a less common nickname sometimes given to Dzyuba in reference to his physical traits and ability to always keep “coming back” (often with a vengeance!). Dzyuba carried on to be effective after the departure of Villas Boas, as Mircea Lucescu used him in much the same role. For Russia he started to play regularly when Leonid Slutsky became manager and he was then instrumental to them qualifying for EURO 2016. At that stage Russia held most promise in their attack with three roughly comparable talented strikers: Artem Dzyuba, Aleksandr Kokorin, Fyodor Smolov. Slutsky improvised by starting with all three during the final tournament. This period of parity was short-lived as Slutsky left and Cherchesov took over: Smolov started to break away from the other two and became Russia’s undisputed number one striker. Dzyuba and Kokorin missed out on the Confederations Cup and it seemed had jeopordised their fate after they appeared to mock Cherchesov’s moustache following the tournament. After this, Kokorin would significantly up his game for Roberto Mancini, who was untactful in his preference for Kokorin. Dzyuba was suddenly left as the odd one out. Unable to fit into Mancini’s plans, it marked the return of Dzyuba’s infamous loans – this time to Arsenal Tula. Dzyuba paid to play against Zenit and scored to win the game for Arsenal, celebrating brazenly in front of Mancini – something he’d even stopped himself from doing earlier when he scored against Karpin’s Rostov. He had turned into a nightmare child for Karpin, Mancini, and Emery when they refused him affection. He still dove into controversy regularly. Not much had changed in that respect, no-one had definitively tamed Dzyuba. The managers with whom he didn’t quibble were largely either the ones who stayed for too short or who didn’t have things all their own way. What if Villas Boas (or Karpin) had been able to sign Falcao? Cherchesov had remained at Spartak? Or if either Laudrup or Lucescu had been given more freedom. Undoubtedly he’d taken his revenge well, but otherwise Dzyuba’s career at Zenit was still up in the air. He risked going in circles. Mercifully, he’d be handed the opportunity of a lifetime as things worked out in his favour. Dzyuba Dictionary: Dzyubamania – commonly refers to the craze surrounding Dzyuba after the 2018 World Cup. Usage of the word however precedes the World Cup. In the run up to the 2018 World Cup, Dzyuba was in a losing race against the consistent goalscoring of Smolov and the exciting form of his team-mate Kokorin. Kokorin’s injury in March gave Dzyuba a way back in and left him only up against Smolov, but it remained the case that Cherchesov usually played with just the one striker, and that was Smolov. It was widely expected that Smolov would be Russia’s brightest star at the World Cup. Cherchesov had had an uncertain relationship with Dzyuba, but he was someone who knew him well, and when Smolov was struggling to find his feet against Saudi Arabia he gave Dzyuba his chance. Dzyuba repaid the faith and became key to Cherchesov’s winning formula, as Russia progressed to unforeseeable heights. It could easily have been a different story of course. For many of Russia’s players in this generation – injuries, bad luck, but also psychological hurdles and have held-back promising careers at the crucial moments (e.g. Oleg Shatov). In Russia’s striker triangle the curse first struck Kokorin, then Smolov (and more recently Kokorin again). Here Dzyuba’s unique personality, along with a bit of luck (and Cherchesov’s guiding hand) saw him in the right place at the right time to maneuver safely – while Kokorin and Smolov, the two classically gifted and technical stars were both left behind. Dzyuba channeled the best of his emotions and directed them towards motivating himself, the team, then the whole country. His passion and hard-work won over many fans and critics. Guus Hiddink summed up this Dzyuba well: “I like Dzyuba, because he has a big heart. He can score a good goal like he did against Egypt but his value isn’t just in this. I know that Artem is capable of rousing the whole team in the dressing room, he gives them lots of courage. You couldn’t call him the most technical or skillful player of the Sbornaya, but you will never forget about his presence on the pitch. He always makes himself known”. For once, rather than trying to prove his own worth and prove wrong the managers who didn’t trust him – Dzyuba ambitiously set on proving wrong an entire country which didn’t trust its footballers. It’s incredible that there was enough of Dzyuba to go round. 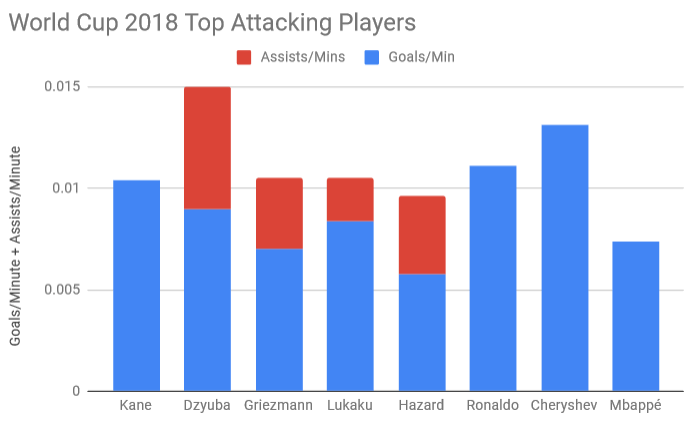 Dzyuba finished as one of the World Cup’s top attacking players with three goals and two assists, but he was also excellent beyond the statistics. Considering his limitations and the wider context of what he’d achieved there: it isn’t crazily far-fetched or biased to throw in the suggestion that Dzyuba was in fact the player of the tournament. With the tournament over a term called “Dzyubamania” was popularised when Dzyuba’s popularity as a public-figure in Russia skyrocketed. Among other things Dzyuba has had a rap song dedicated to his Dzyubinator alter-ego and he was named man of the year in 2018 by GQ magazine. Dzyuba Dictionary: Dzyubozavisimoy (Dzyuba dependent) – Dzyuba has played down the suggestions that the Sbornaya has since become dependent upon him. Dzyuba has shown that he is not just a greedy, needy Spartak child who wanted more than he should reasonably expect. In the end he surpassed many of those once given a bigger plate, because he was hungrier and more motivated for sporting success. Make no mistake about it – Dzyuba remained himself, he stubbornly followed the unpopular path that he set out for himself to ironically end up where he did. Only arguably Dzyuba showed a better version of himself – he evolved. The World cup was the perfect catalyst. True coincidences are rare and of course there are too many controversial incidents in Dzyuba’s career to look past. Even if Dzyuba has on the face of it matured – he will always be a stubborn and complicated person, moulded from chaos. He will also remain a footballer with a very specific set of qualities. What matters is that he has demonstrated progress and proven himself at each hurdle. He now has the status and affection he always wanted, and control over his future. With his popularity in Russia he could even easily form his own authentic sect. A move to England broke down after he says he was misled by agents, but the option to consolidate his position at Zenit will continue to be realistic, now almost irrespective of the manager – he has won over the club by default after he won over the nation. Moreover with the retirement of Igor Akinfeev and Sergei Ignashevich, it is difficult to imagine anyone replacing Dzyuba as captain while Cherchesov manages Russia. If Dzyuba does decide to go to England he leaves behind a comfortable situation and will be worthy of respect regardless of the outcome. He has already proven that he is a high-class footballer and completed his mission in Russia.